FORT LEE, N.J. – CareOne LLC Chief Executive Officer Daniel E. Straus has announced that CareOne’s Wednesday night Feb. 12 gala Valentine’s Ball exceeded its $1 million goal, raising $1.1 million in support of The Valerie Fund and the thousands of New Jersey children with cancer and blood disorders for whom it provides care. More than 900 people, including numerous celebrities, attended the event, held in the Maritime Parc in Jersey City. Celebrities attending included Victor Cruz of the New York Giants, Antonio Cromartie of the New York Jets, former New York Ranger Sean Avery, actor and Broadway star singer Rob Evan, Melissa Gorga of “The Real Housewives of New Jersey,” and Brian Leonard of the Tampa Bay Buccaneers. Evan entertained with a medley of Broadway musicals. CareOne executives and team members from CareOne Centers in New Jersey, and affiliated companies HealthBridge Management and Care Virginia Management located in Massachusetts, Connecticut, Pennsylvania, Maryland and Virginia worked energetically to raise money for the companywide fundraiser, and more than 200 CareOne executives and team members attended the event. In their remarks, Valerie Fund co-founders Ed and Sue Goldstein recounted how The Valerie Fund was founded, in memory of their daughter, Valerie, who lost her battle with cancer in 1976. They could only obtain advanced treatment for Valerie outside of New Jersey, with long drives and complicated logistics. The experience caused them to found the fund, which now supports seven Valerie Fund Centers, six in New Jersey and one in New York City. Now, said Ed Goldstein, “A child suffering from this terrible disease no long has to be a step-child to New York and Philadelphia. He and she now have their own home,” The Valerie Fund Centers. Numerous vendors and suppliers of CareOne and associated companies participated in the event. Additionally, more than 20 healthcare and hospital executives from across New Jersey attended, including representatives from the seven top hospitals at which Valerie Fund Centers are located. Along with celebrity appearances, the festive evening of dinner and dancing also featured both live and silent auctions. In addition to supporting treatment at the Valerie Fund Centers, some of the funds raised will go to providing scholarships, transportation to treatments for patients who otherwise would have to depend on public transportation, and Camp Happy Times – an annual free one-week overnight camp experience for 200 children who have or have had cancer. 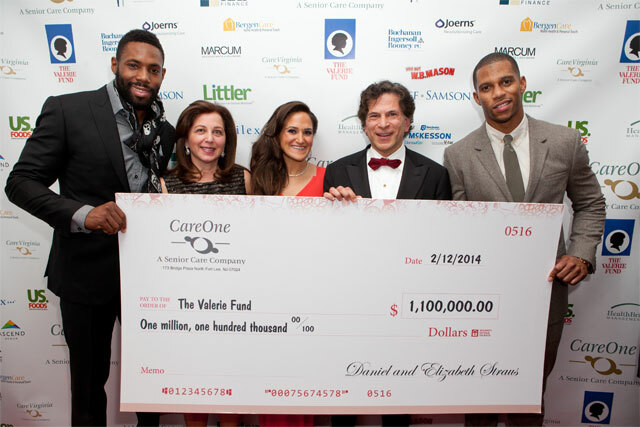 In late December 2013, the CareOne community joined together to provide more than 3,000 toys to Valerie Fund patients just before Christmas. The CareOne community has now raised more than $2 million in charitable donations in less than two years. More than $1 million was raised at a December 2012 CareOne Disaster Fund event to aid more than 100 CareOne employees who suffered significant losses during Hurricane Sandy.